Why choose Tobin Productions for your CD Duplication or CD Replication? Tobin Productions has been duplicating digital media for over 30 years, on-time, on budget, and 100% guaranteed. PLEASE assure that you have completely checked your master, as our digital process makes no changes and will create an exact duplicate of your submission, and we cannot be responsible for errors or omissions. Pre-mastering services are also available if you have any questions. Recordable Compact Disc technology offers a reliable and cost effective alternative to CD replication if you're on a tight schedule. Creating reliable CD's for distribution to a wide range of players requires far more than simply "copying a CD;" they must be duplicated and tested to a standard with specialized equipment in clean environments to ensure their shelf life in the market is sustained. Offering CD Duplication services throughout the United States, our process is proven, and the final product looks great if CD Replication isn't a time-effective option for you or your organization. CD-R's can hold up to 700Mb of data and/or 80 minutes of audio. CD Capacity up to 870 Mb. 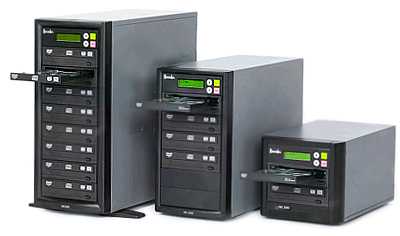 Our CD Duplication in New York City can produce 1,000's per day. Production masters are tested for physical defects, error count and electrical signal integrity using specialized equipment prior to duplication. Screen printed blank discs can be overprinted with version information, security codes, bar codes, user instructions, track listings. Full color prints are available for short runs. Pre-mastering services are available to convert data supplied on other forms of recordable media.